Make sure your bucket list has two visits, you are going to need them! 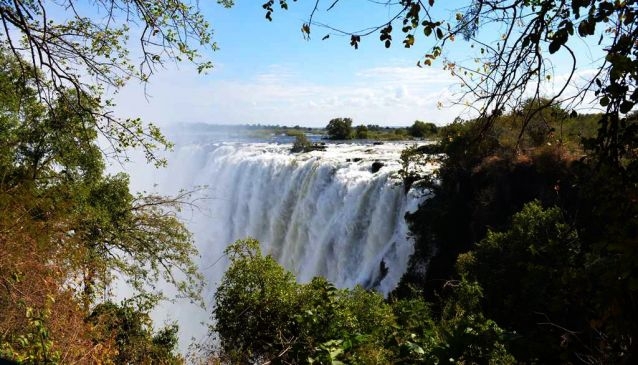 Victoria Falls is probably Zambia’s most well know tourist attraction, although there are some who think it is in South Africa, near Cape Town I have heard. 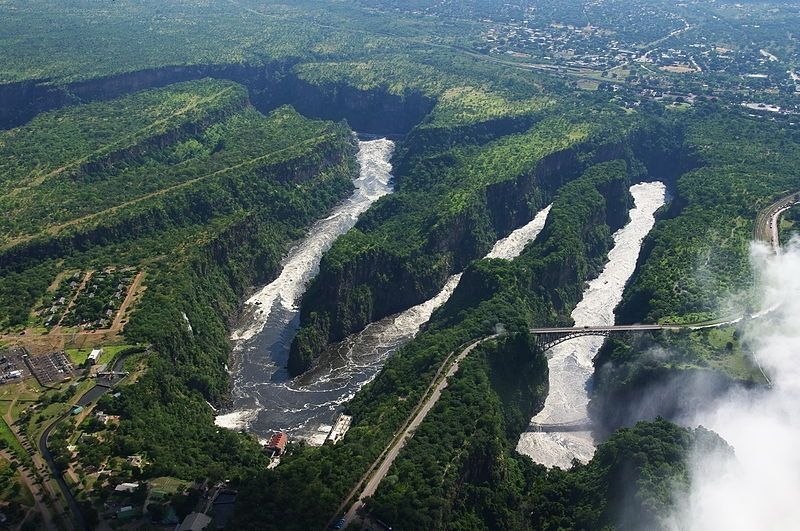 Others mistakenly believe it is solely in Zimbabwe, but this amazing natural wonder is shared very amicably by both Zambia and Zimbabwe. There are many oft spouted facts about David Livingstone “discovering” the falls so I decided to dig a little deeper and find out more. Obviously the word "discovering" was used in a Victorian sense from a time of great explorations, discoveries and inventions. Today we accept that people have been living in the area for hundreds, if not thousands, of years and Livingstone was probably the first European to see the Mosi-oa-Tunya. If he wasn’t the first, he was certainly the first to publicise his experience. In 1851 David Livingstone, his wife Mary, who gave birth to their fifth child on the journey, 3 surviving children and wealthy English hunter and explorer, William Cotton Oswell, reached Linyanti in the modern day Caprivi Strip, Namibia, having travelled up the Savuti Channel. To the north, at Sesheke, Livingstone and Oswell came to a wide river with huge floodplains and were told of a great waterfall. On this occasion they made no attempt to reach it. Oswell marked the position of the waterfall on a manuscript map that remained unpublished for almost 50 years. 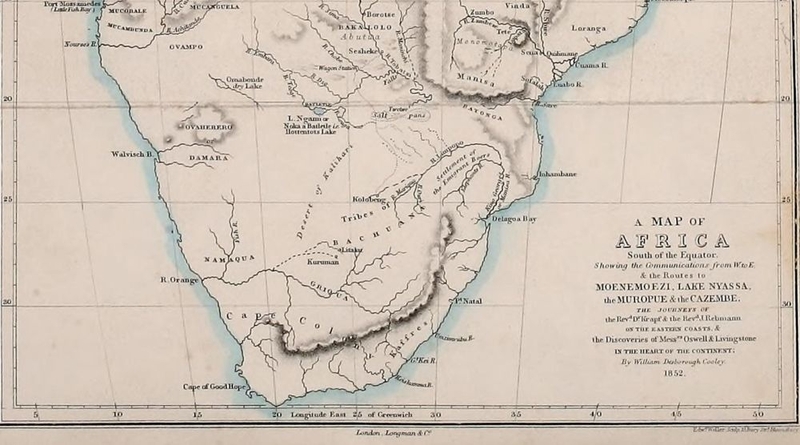 In 1851 the cartographer John Arrowsmith produced a map, reproduced in the book “Inner Africa Laid Open” by W D Cooley and published in 1852, showing the existence of the "Mosi-wa-thunwa" Falls in approximately the correct position on the Barotse River. This map probably carried on the tradition of filling in the centre of Africa with features heard of but not yet verified by explorers. At that stage it was believed that the Zambezi was actually two rivers. Cartographers would not accept Livingstone’s claims that the Barotse or Sesheke or Toubatsi (upper Zambezi), and the Zambezi were the same river. In “Inner Africa Laid Open” W D Cooley suggests that the Toubatsi turns south after the falls and dries up in the salt pans of modern day Botswana. Livingstone returned to Cape Town with his family and Mary and the children boarded a ship bound for England. In 1852 he began his exploration of the Zambezi whilst exploring the possibility of opening up trade routes between the east and west coasts. It was not until 16th or 17th November 1955 (he discovered his dates were out by four days) that he actually saw “the most wonderful sight I had witnessed in Africa.” Livingstone gives a graphic description of his approach and of the actual falls and surrounds but I often wonder, this was November, imagine what his description would be if he had seen the falls in full flood! Stand and feel the ground vibrate as 500 million litres per minute plunge over the lip and into the boiling pot below. Hunched over your camera trying to prevent it from getting soaked to get a photo of a vision in grey! Don’t bother to spend time on your hairdo before you visit, it will get wet regardless of umbrellas or rain ponchos. Turn your face to the spray and marvel at how so much water can pound and thunder and plummet over the edge of a fissure to churn, bubble and rush through a narrow gap before tumbling on twisting and turning, zig-zagging through the eight gorges, each one a previous location of the falls. I personally think that one of the most spectacular aspects of Victoria Falls is the fact that you cannot stand back, look up and survey the entire cascade, rather you glimpse it from different angles only getting a partial view, knowing that there is more, so much more. Walk through the rainforest opposite the plunging waters and pop out at the various viewpoints. Catch a rainbow as the rising spray swirls and twirls upwards. 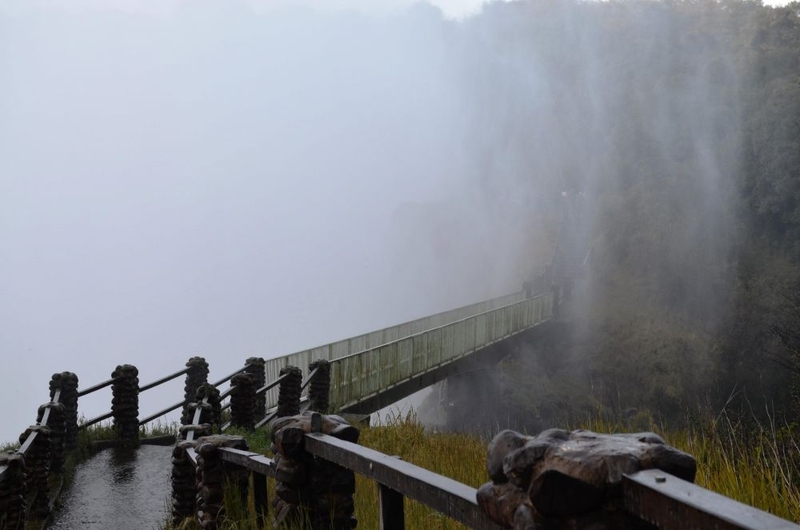 Carefully, oh so carefully, traverse the Knife Edge Bridge, dripping wet and slippery and finally, peer across the gorge at the tourists in Zimbabwe viewing their version of this wonderful spectacle. But, come back in the dry season, September to November, and witness a different falls. Far, far less water gushing over the edge so you can wonder at the glistening dark basaltic rock walls, take a trip to Livingstone Island and peer over the edge as the explorer did. This is a no less spectacular sight, just a completely changed one. In fact, make sure your bucket list has two visits on it, having seen the one version you really do need to see the other. If you are truly lucky, and your visit coincides with a full moon rising early enough, you could witness the very eerie lunar rainbow. People chat in hushed tones, your mind tells you that the sun is not here so this should not be happening and yet, there it is, easy to see, a rainbow at eight, nine, ten at night. How special is that? The only way to truly see and appreciate the entire spectacle is from the air. Looking down you can but marvel at this geological wonder and feel awed by the years of change that have gone before your insignificant self. Look back at where the falls have been and try to look forward to where the next will be millennia from now. You truly feel like an angel in flight. So, I close with more words from David Livingstone "The snow-white sheet seemed like myriads of small comets rushing on in one direction, each of which left behind its nucleus rays of foam." 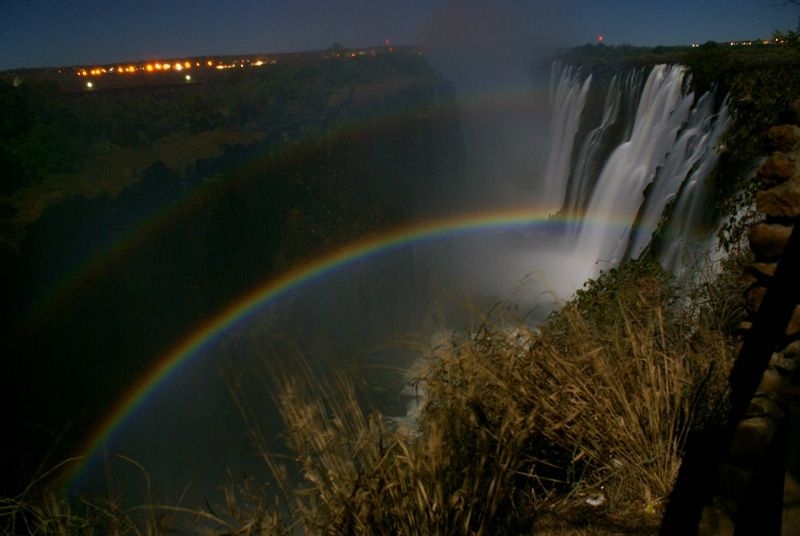 The Victoria Falls can certainly bring out the poetic side of a person.